How tall should my floor lamp be? The bottom of the lamp shade should be at eye level when you are sitting down. Generally this would be 38 to 42 inches from the floor if the lamp is beside you and up to 49 inches if the lamp is behind you. Lamp shades 15 inches wide or more supply the most ample light for reading. What type of lighting is best at my desk area? Small table or desk lamps will provide task light directly onto the desk top without causing glare the way overhead lighting can. Must my table lamps be the same? No, as long as the height is the same and the colors and shapes blend with each other, two different lamps can add an element of surprise to your décor. What size should my table lamps be? The table lamps must be comparable scale to the furnishings they are near. 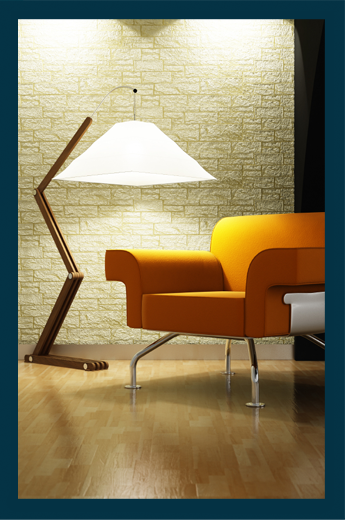 High sofa backs or arms call for larger size lamps. Also, consider the size of the table they will be on. The width of the lamp shade should not be bigger than the table it is on. What else should I consider when choosing table lamps? Consider the purpose of the light. Is it purely decorative? If so, you can choose whatever style you love. If its purpose is mostly for a task, like reading, you must then consider the wattage (3-way 150 watt are good for reading lights), and the size and color of the lamp shade. Wider shades (at least 15 inches diameter) allow an adequate amount of reading light to be available. White and beige shades allow the light to shine through. Dark or Black colored shades will contain the light and only allow the light to shine down onto the table top.